Enchanted Closet a volunteer-run nonprofit organization serving teenage girls from low-income households across metro Atlanta, is hosting an Enchanting Lives Prom Dress Drive and Mixer to collect donated items for its 12th Annual Prom Dress Giveaway season and to meet others in the community that want to make a difference. 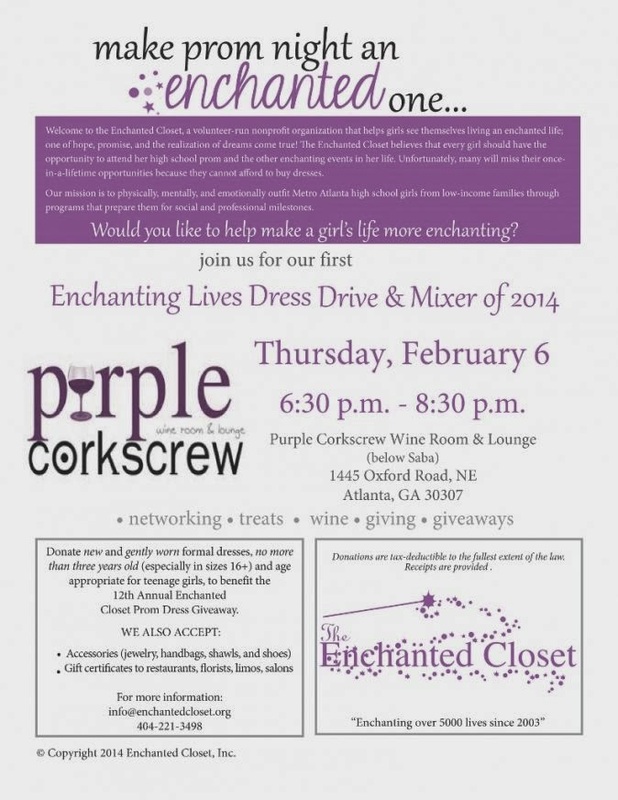 The dress drive will be held on Thursday, February 6 from 6:30 to 8:30 p.m. at Purple Corkscrew Wine Room and Lounge www.purplecorkscrew.com, 1445 Oxford Road, Atlanta, 30307 (beneath Saba). The free event will include networking, treats, wine, giving, and giveaways. The Enchanted Closet’s Prom Dress Giveaway began in 2003 as a project to provide prom dresses to teenage girls whose families were financially challenged. To date, the Enchanted Closet has outfitted more than 5,000 girls for special occasions. During the Prom Dress Giveaway, the Enchanted Closet offers a boutique-style setting and provides personal shoppers – people who are volunteers – to help each girl choose that perfect dress, accessories and makeup for their special night. Enchanted Closet encourages girls to be smart shoppers by providing them an opportunity to get beautiful gowns for $10, a handling fee that helps to offset the costs of dry-cleaning, alterations, and set-up. Accessories are available on a limited basis. The 12th Annual Prom Dress Giveaways will take place on Saturday, March 15 and Saturday, March 29 from 10:00 am p.m. to 3:30 p.m. at the New Vision Christian Church and the Rialto Center for the Arts at Georgia State University. Girls interested in receiving prom dresses should visit the Enchanted Closet website,www.enchantedcloset.org/student-registration to reserve an appointment. Persons interested in volunteering. may register at www.enchantedcloset.org/volunteer-registration. Advanced registration is required to participate in Prom Dress Giveaway. If unable to attend the Dress Drive event at Purple Corkscrew Wine Room and Lounge, the Enchanted Closet is collecting donations of prom attire and accessories for Prom Dress Giveaway from now through April. Monetary donations may also be made at www.enchantedcloset.org. The Enchanted Closet is a volunteer-run, private non-profit service organization whose mission is to physically, mentally, and emotionally outfit Metro Atlanta high school girls from low-income families through programs that prepare them for social and professional milestones. Established in 2003 to distribute prom dresses to girls in metropolitan Atlanta, the Enchanted Closet also offers a GIRL$™ Service-Learning Program throughout the year to increase the self awareness, self esteem, and self sufficiency of girls. For more information, visit the Enchanted Closet Web site at http://www.enchantedcloset.org.